Big, bulky work gloves should be a thing of the past. With advanced technologies all around us, it's no wonder why even our men's and women's workwear is progressing forward into more useful, comfortable designs. Take these Black Stallion GC2030 GY AccuFlex Grey Ni ... (see full details) (see specifications) #GC2030-GY. Big, bulky work gloves should be a thing of the past. With advanced technologies all around us, it's no wonder why even our men's and women's workwear is progressing forward into more useful, comfortable designs. Take these Black Stallion GC2030 GY AccuFlex Grey Nitrile Coated Nylon Work Gloves, for example. When Black Stallion created these helpful gloves, they didn't go with old school ways of manufacturing them. Back in the day, workers covered their hands in whatever the closest men's or women's gloves were nearby, without thought to how well they'd actually help them work. This special design has a tough grip for easy handling, especially for heavy contact work, and the smooth nitrile coating gives even more protection to your hands. Since these are all-purpose nitrile coated gloves, you'll probably want to wear them just about everywhere (except maybe when you're at the bowling alley, which is the first non-work-related place we could think of...just imagine eating pizza while you're wearing these - we say the gloves stay off in this case). For ease of movement, these unique Black Stallion gloves feature knit cuffs that fit just right around your wrists for excellent comfort and flexibility. As you lift, hammer, box up, and wave to the truck driver hauling off some of your latest vehicle parts to be shipped out or that load of firewood you just sold, the 13-gauge nylon knit of the AccuFlex gloves will see you through it all. The Black Stallion grey gloves are coated with a tough nitrile to give you high quality durability. This also provides chemical resistance, which protects your hands even more. You'll want to wear these AccuFlex dipped gloves often, since their tough grip makes picking up boxes, firewood, buckets, tools, and whatever else you need to pick up a whole lot easier. If you're involved in any type of heavy contact work at your workplace, these are the ideal choice for you. So let the gripping nitrile coating, paired with a comfortable 13-gauge nylon knit of these Black Stallion GC2030 GY AccuFlex Grey Nitrile Coated Nylon Gloves help you during your rigorous work day. Order your pair today, right here at Working Person's Store. 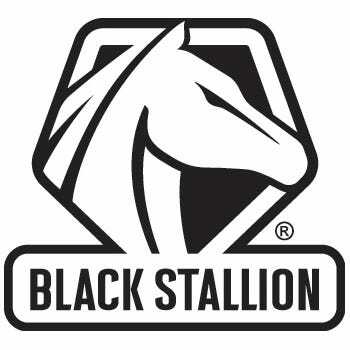 Perfecting the work glove design is what Black Stallion continually strives to do, and you get to benefit from their efforts by wearing this workwear. I wear these to work outside and to garden. They keep your hands dry and give you an added layer of protection that regular garden gloves don't give you. They provide a barrier between you and your chemicals and protect you from punctures and scrapes. I cannot imagine ever going back to regular garden gloves. They are also easy to clean up and inexpensive enough to replace as needed. I honestly don't know what these Black Stallion gloves were designed for or their original purpose but during salmon season these are my favorite gloves. I have never lost a fish out of my boat because they get a good grip and form nicely around my hands. They are cheap enough that I just toss them out when they get to dirty and stinky. When it comes to a good cheap and almost disposable gloves, these Black Stallion gloves are the best and for three dollars it cant be beat. I always keep a box of these on the factory floor for the guys to use when they need them. They usually last a good solid month or so and then we toss them out and buy more. Great product! I searched long and hard for a pair of comfortable gloves to wear out on the fishing boat. The Black Stallion Gloves don't hold water, which is great. If they hold water then it makes them heavy. They are nearly slip resistance. I can grab a forty pound salmon by the tail and gills and it wont slip or flop away. They are easy to clean and will last a good fishing season. These Black Stallion gloves are great for working environments. They are thin, yet not easily torn. They allow full movement with out restrictions when you are trying to climb or hold on to something. They also serve as protection from the cold. They will keep your hand from becoming too cold while working in the weather. They are also good in the summer because they are not to heavy. Thank you for sending me the receipt for my purchase. You and your staff have been very helpful. I work at Carhartt, in Dearborn, MI, and it's great to see the level of service you provide to all customers. Thanks again, and have a great day! Black Stallion Gloves: GC2030 GY AccuFlex Grey Nitrile Coated Nylon Work Gloves is being added to your cart.